John Dunn has lived in his house in Cambridge for a long time. In 1957, his parents bought the house and 19-year-old John, his two siblings, and their parents moved into a lovely single-family home – the American dream. After his brother and sister got married and moved out, and his parents died (his dad in 1975 and his mom in 1987), John inherited the family home. John has always been a hardworking, independent person. When he was 21, he got a job at Raytheon, where he worked on prototypes of the internal guidance systems for rockets to go to the moon. John worked at the company for 36 years, retiring in 1995. But retirement didn’t’ suit John! He then went to work for Avis Rent-A-Car and for several security companies, and also went back to school in 2009 to begin the process of getting a certificate in Computer Science from IITT Technical Institute. But, over the years, the house needed updates and maintenance that John couldn’t afford and so, important repairs and replacements just didn’t get done. Also, John developed some health issues that impact his mobility. All these challenges put John at risk of losing his home. That’s when John met JAS, and began working with the staff of the JAS’s Home Improvement Program (HIP) to find the resources to save his home. With help from HIP and Somerville-Cambridge Elder Services, John refinanced his home and also got grants from the Cambridge Historical Commission, Massachusetts Rehab Commission, the City of Cambridge, and Menotomy to do structural construction, a new heating/cooling system, energy insulation and a new roof, deleading, and overall improvements and updates on the interior and exterior of the house. The result of this investment of everyone working together in partnership? 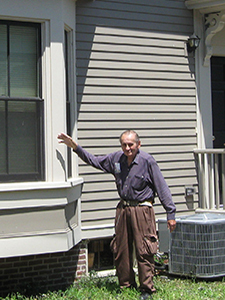 John’s home is restored to its former beauty and value, and he is in a safe, affordable living environment adapted to his needs and abilities. Now, at the age of 78, John can focus on finishing his certificate from ITT Technical!